A concept ambulance and an electric local delivery vehicle with battery powered refrigeration to be demonstrated at the Tokyo motor show. Nissan will unveil two new fully customised vehicles at the Tokyo Motor Show to improve city mobility: the new Paramedic Concept and the all-electric e-NV200 Fridge Concept. Packed with new technology and features, the Paramedic Concept will be Nissan’s fifth-generation ambulance and builds on the success of the previous versions, which are sold exclusively in Japan. 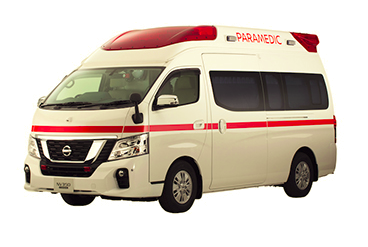 The next-generation ambulance is based on Nissan’s NV350 Caravan, providing better comfort for the patient and a better work environment for paramedics and drivers. The company will also lift the lid on its product to overcome urban delivery challenges and launch a modified, all-electric Nissan e-NV200 Fridge Concept. The Fridge Concept’s compact size will make it easier to park in urban environments, where large delivery trucks are often prevented from stopping. Equipped with an additional battery pack in the cargo space to power a refrigeration unit, the Nissan e-Fridge will be able to store chilled foods. “Our fifth-generation ambulance will offer enhanced features that will make a real difference to people’s lives,” said Ashwani Gupta, senior vice president of the Renault-Nissan LCV Business Unit. “The new Paramedic Concept contains vital life-saving equipment to respond to emergencies, often in remote areas. Other unique elements packed into the new ambulance include Nissan’s industry-leading Intelligent Around View Monitor and technology to reduce the spread of germs.